Whether a simple supply-only or a complex multi-branch commercial domestic hot water system with recirculation, the key to delivering reliable hot water temperature is in the point-of-distribution mixing valve. Are there practical guidelines to assist you in choosing the most suitable mixing valve for your DHW application? 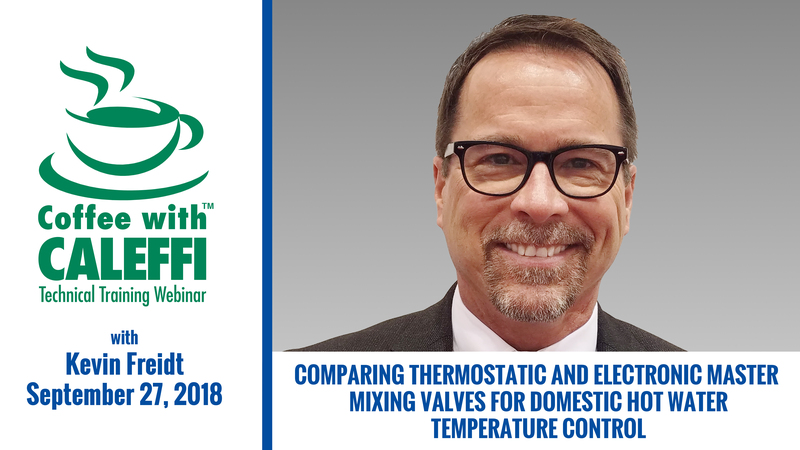 Kevin Freidt, director of product management and technical support, will take an in-depth look at the design and functional differences, performance and accuracy, sizing and selection, service and maintenance considerations and application of these valves. → What are the differences in how they work? → Is one better or more accurate than the other? → Are there important service, maintenance or repair differences to consider? → Which is better at handling low flow conditions? How about high flow, larger projects? → Are there differences when it comes to recirculation applications? → Can a thermostatic valve be used in a system where disinfection to kill bacteria is used? Freidt is the intellect behind sizing up the best product offerings in a moving target market and manages an exceptional technical support team. He has a B.S. in Mechanical Engineering Technology, 30+ years’ of experience in the commercial HVAC industry and is a LEED AP. Our audience will thoroughly appreciate his academic passion and concise content delivery. Coffee with Caleffi technical training webinars are free and intended for contractors, designers and wholesalers. All attendees receive a Certificate of Attendance following event. By submitting your webinar registration, you are consenting to email communications to keep you up-to-date on industry news. Please note that your personal information is respected and NOT shared externally. Missed a webinar? No problem, our webinar archive is available 24/7 for your convenience. If you have questions on webinar content, please direct them to bob.rohr@caleffi.com.